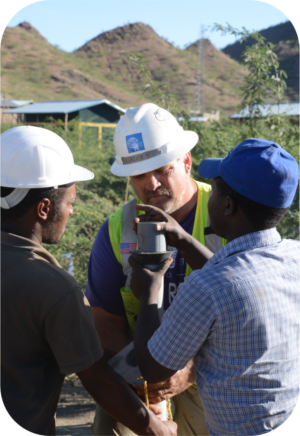 Engineers Without Borders USA’s Engineering Service Corps began work in drought-stricken Ethiopia in June, and since that time has assessed 51 wells, 35 of which have been repaired. These improvements brought water to more than 100,000 people. Learn more below about EWB-USA’s December trip to Ethiopia to continue this life-saving work. After volunteering for two weeks in water-starved Ethiopia, where she repaired water pumps, EWB-USA volunteer Erin Cummings knows firsthand not to take clean water for granted. The 29-year-old water engineer with CH2M is based in Chicago and is vice president of EWB-USA’s local chapter there. In late 2016, she teamed up with Mike Paddock, a civil engineer and the Deputy Director of EWB-USA’s Engineering Service Corps, to repair half a dozen hand pumps in Ethiopia. The pumps are essential not only for the health of local villagers, but also for the wellbeing of their livestock. “Without the wells, villagers were walking up to six hours roundtrip to collect water,” Erin says. She saw villagers use rope to attach 40-pound cans of water to their backs, then lift and carry still more water containers by hand. EWB-USA is partnering with Project Concern International (PCI) to provide technical assistance for the Ethiopia Emergency Drought Response and Rehabilitation (ENDURE) project focused on Ethiopia’s Afar and Bale regions. 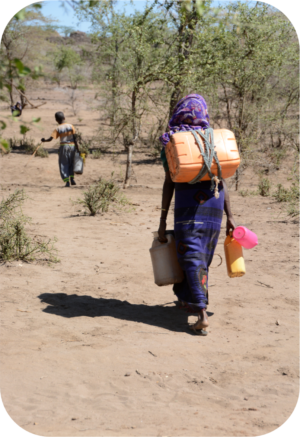 Ethiopia is experiencing one of the worst droughts in decades due to the effects of El Niño. Hundreds of thousands of livestock have died from lack of food and water, leaving communities in the desert region of Afar and the migratory populations in Bale food insecure, malnourished and vulnerable. And while Erin says that her day-to-day engineering projects at CH2M are definitely “challenging and interesting,” her Ethiopia experience offered an opportunity to “work on a project where the impact is really meaningful.” Most westerners enjoy ready access to clean and inexpensive water, she says. But in Ethiopia, access to clean water is anything but a given, boosting the importance of fixing water pumps for communities in need. She and Mike together worked to repair India Mark II hand pumps, which are among the most widely used in the world. Despite their widespread use, however, few if any of the communities that Erin visited had access to the tools needed to work on the pumps. Without proper tools, hand pump repairs are prone to accidents, like severe injuries or dropping the pump into the well. In one instance, the community had previously tried to raise a 150-foot column of pipes, but the pipes fell back into the well. At each site, community members were on-hand to help where able. Erin and Mike trained local pump technicians to ensure operation and maintenance could be sustained after their departure. Other villagers contributed, too, by frequently offering the two EWB-USA volunteers lunch, coffee or a special treat. Besides her work in Ethiopia, Erin has volunteered with EWB-USA’s Engineering Service Corps for projects in Guatemala and Afghanistan. In Guatemala, she worked on a feasibility assessment for a micro-hydroelectric dam in Joyabaj (a city of 100,000 people) and a monitoring and evaluation of the infrastructure in the 250-person village of Nuevo Providencia. She also worked on an Engineering Service Corps project in Afghanistan where she did a technical review of a stormwater project in a internally displaced persons camp for United Nations Habitat. “Working with Engineers Without Borders USA has helped me develop project management and technical skills,” Erin says. In particular, she says she found great value in working alongside Mike, who has 30 years of engineering experience and has volunteered with EWB-USA since 2005. “Working directly with Mike was an exceptional opportunity for me. Development work is difficult because you never have ideal conditions, and you have to make the best possible decision with those conditions in mind. How to navigate those situations was one of the most valuable lessons I learned from Mike during our time in Ethiopia,” Erin says. The Engineering Service Corps has completed its commitments in Ethiopia for now, but the contributions of this elite program of seasoned volunteer engineers continues in Guatemala, Kosovo, Malawi, Morocco, Mozambique and Tanzania — with even more projects in development! All photos courtesy of Erin Cummings.